Being a Fulbrighter meant that I was a part of something far bigger than myself: something that encompasses people and ideas from all around the world — a shared effort to push humanity a step forward to create a sustainable peaceful future for all. 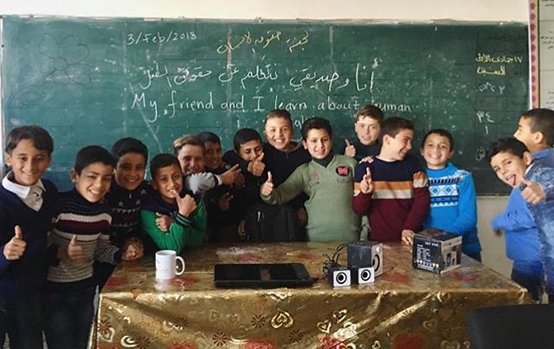 The end of an interactive session on human rights, focusing on children rights, at an UNRWA school where I have worked as an English teacher. After I finished my master’s in the United States, I went back to Gaza. 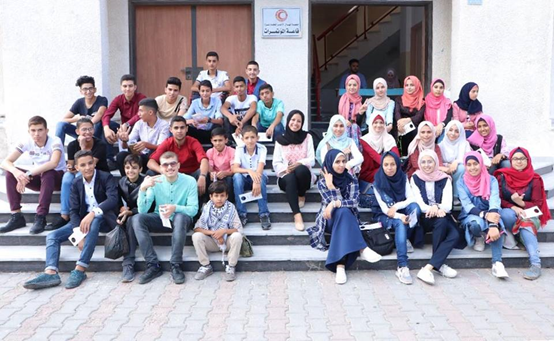 One of the most important projects I have been working on has been teaching the English Access Microscholarship Program, funded by the U.S. Consulate in Jerusalem and administered by AMIDEAST. I have never enjoyed teaching English as much as I do now, and I absolutely love working with teenagers on personal development and community engagement. I took a learner-centered approach to teaching these young boys and girls about civic values and self-improvement. 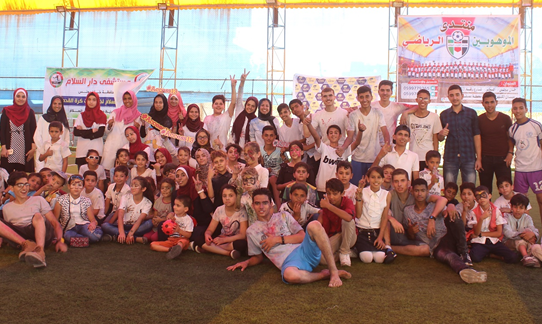 Group picture at the end of a community service activity for Access students with children from the neighborhood. We had a color war so most of us are covered in blue. Teaching topics of this sort is not an easy task at all. Some of the values or new knowledge the students are subjected to clash with existing social values. The students would have to debate among themselves and decide how to incorporate new knowledge and new values into their society. To these young people, the program has become more than a two-year scholarship program. It became an opportunity to engage in high level thinking, discuss grand ideas, and acquire useful interpersonal skills to communicate their viewpoints. Through my work, I mentor teenage boys and girls, and guide them towards establishing a better future for themselves and their community. In other projects, I work with children and adult men and women. I pass the lessons I learned on to them. If I can positively influence ten individuals, they will in turn spread the influence to hundreds of other people. Manar graduated from New York University with a Master’s in International Relations in 2017. She is from and currently lives in Gaza.